Meet the newest inks from Rohrer & Klingner. 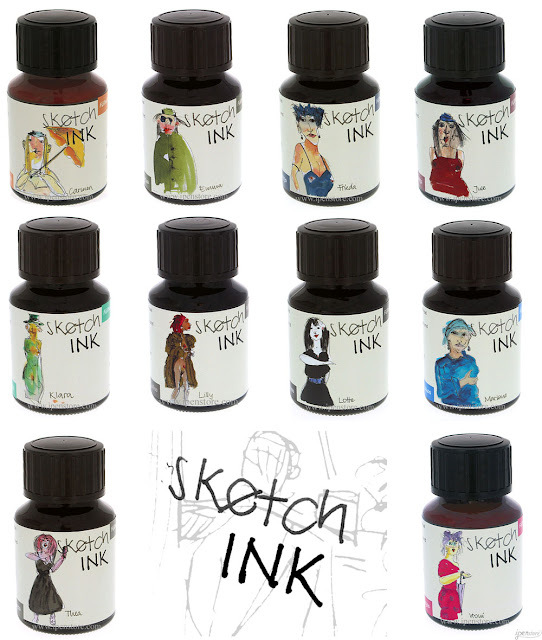 sketchINK® is an assortment of 10 fountain pen inks specially formulated for drawing and sketching. These inks are suitable for use in fountain pens, quill pens and brushes. The inks are extremely waterproof and lightfast. Rohrer & Klingner uses the smallest pigments to enable an optimum ink flow, making sketchINK® perfect for drawing fine outlines. Shortly after, lines are dry and can be painted over. 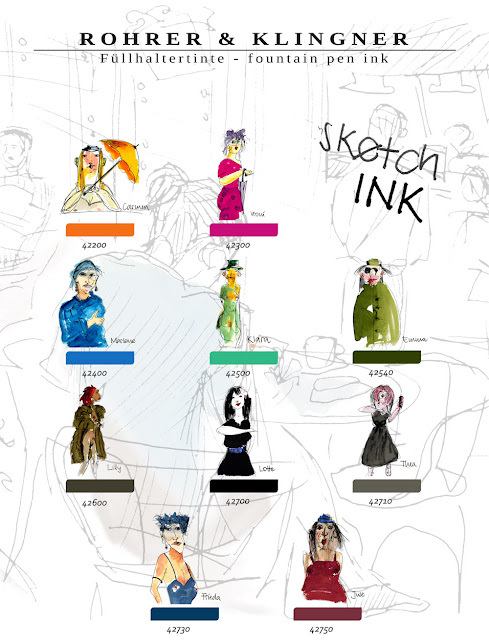 On the surface, sketchINK® can be painted with water to create brilliant highlights, making it the ideal companion for urban sketchers, designers, graphic artists and architects. Since the ink is waterproof, it can happen that the fountain pen dries out, so it is recommended that the ink is not left in the pen too long. In the case that it does dry, Rohrer & Klingner has developed a fountain pen cleaner called "Reiniger." Shown with brush - can also be used in fountain pens and dip pens. Founded in 1892 in Leipzig, Germany, Rohrer & Klingner fountain pen inks are made following well established recipes using specially treated water, natural ingredients and brilliant colorants. The well-balanced composition makes for optimal ink flow.